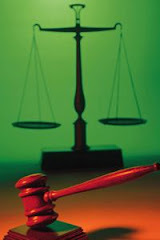 Real-life drama of three wealthy families connected by marriage and murder.This book recounts the shocking events, obsessive love, and bitter custody battles that led toward the bloody climax that took nine lives. 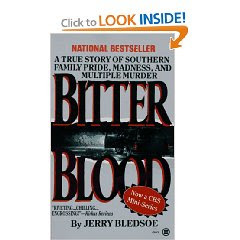 If you enjoy reading family saga books and you also enjoy true crime books then you are doubly blessed with this book.Jerry Bledsoe tells this amazing story so well that you will find it hard to believe that it is actually based on a true story and the evil doings and drama did in fact occur in real life. Jerry Bledsoe spins this tale like a true professional seeking to find answers, I believe, as he himself was writing.The main characters are such complex personalities that you would imagine it would be hard to keep up with them.Yet the reader is able to do that because of the way that Jerry Bledsoe writes.The story flows so well and navigation is effortless despite the vast number of twist and turns in this story. Jerry Bledsoe succeeds in writing this very complicated story and the result is Bitter Blood,an absolutely powerful and well written book with the needs of the reader,first and foremost. I absolutely and definitely recommend this book for reading.I personally dare anyone who did not enjoy this book to come back and post their comments below.It is brilliant and one of the top books of true crime that I have ever read. To find out more about this book please go to Kalahari Books for South African readers and below for the Amazon link. I read this book in May 2007 and the story is still very fresh in my mind.Despite being as thick as a family saga novel with 573 pages believe me when I tell you that you will not want to put this book down until you are finished.One of the most brilliant books I have ever read.It also has 16 pages of photographs of the people involved in this true crime story. Ditto on everything you said. The main events happened about ten miles from my home. I live in Eden, about ten miles or so from Reidsville.